Space.com Editors have selected 12 Great Telescopes in 4 Categories. Are you a traveler? Student of the sky? On a budget? Live in a small home? Do you like digital tech? Or prefer an analog approach? Update: ThinkGeek now offers 7% cash back on all purchases made through Purch Perks as well as exclusive coupons and deals for Purch Perks members. The online store creates fun and unique products and apparel inspired by science and science fiction. Check out the latest ThinkGeek deals here. Space.com's parent company, Purch, has launched a new loyalty program called "Purch Perks" to reward readers who shop online with cash back on every purchase, plus other exclusive deals. Becoming a Purch Perks member is totally free, and members can use the new platform to shop online with more than 100 of our retail partners. 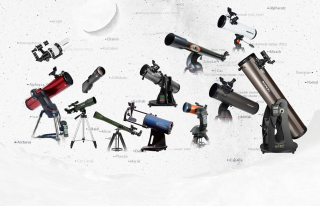 For space fans, this means you can earn cash to purchase telescopes and other skywatching gear. Or you can shop for space-themed gifts from any of Space.com's gift guides. Purch brands like Space.com, Live Science, Top 10 Reviews, Tom's Guide and Business News Daily publish content to educate and inspire readers while helping them make informed decisions about purchases. Our sites offer product reviews, buying advice and general information about more than 1,200 product categories including technology, consumer electronics, outdoor goods and more. "As we continue to expand our content and commerce capabilities, we've thought a lot about high-value services that simplify the consumer purchase journey and create a tighter connection between buyers and sellers," said Greg Mason, CEO of Purch. "Purch Perks is yet another service we’re offering to our members to seamlessly facilitate their buying decisions and cement their loyalty." In 2015, a new shopping platform for outdoor gear, Active Junky, and the mobile shopping app ShopSavvy joined Purch. This acquisition sparked the creation and evolution of Purch Perks, which is built on Active Junky's platform and is now available on the ShopSavvy App. In addition to cash back and other benefits, Perks integrates content published by Purch brands with the shopping experience, so members have easy access to reviews and other useful information while they're shopping. Rewards from Purch Perks are tiered, so the most active and loyal shoppers will receive the most cash back and other benefits. To sign up for free, visit the Purch Perks web page: www.purch.com/perks.